What works for one person doesn’t necessarily work for all, and physical exercise is no exception to this. We are all different both physically and genetically, and we are different in the way that we respond to exercise. Some of these differences are due to our lifestyle and the environment we live in, but recent scientific advances have shown that variations in our DNA also have a big part to play. Our mission at Genetrainer is to take personalization of your workouts to the next level, with training plans, exercises and advice personalized to you using your DNA. Genetrainer stays up to date with your fitness level through connection to a range of popular devices and apps, combining lifestyle and genetics to give you the fastest route to achieving your individual training goals. Reaching your full fitness potential is easy with Genetrainer. We believe there’s no better form of motivation than watching your fitness improve. Connect automatically and wirelessly with your fitness devices and popular training apps from Fitbit & Jawbone to RunKeeper, Withings and more. Track your weight, sleep and heart rate and watch as your fitness improves. Genetrainer stays up to date with your fitness level to give you the challenges and motivation you need to help you reach your goal. Your results are based on millions of dollars of published scientific research. The study of genetic variation is a rapidly advancing area of science, and new discoveries are being made every day. These new discoveries are analyzed by our team of experts so that your fitness advice is as up to date as the most advanced scientific research. Stay at the cutting edge. All the time. Find out how your genes may be influencing other areas of your sporting life. Do you find it difficult to keep the weight off? Your genes may be partly responsible. 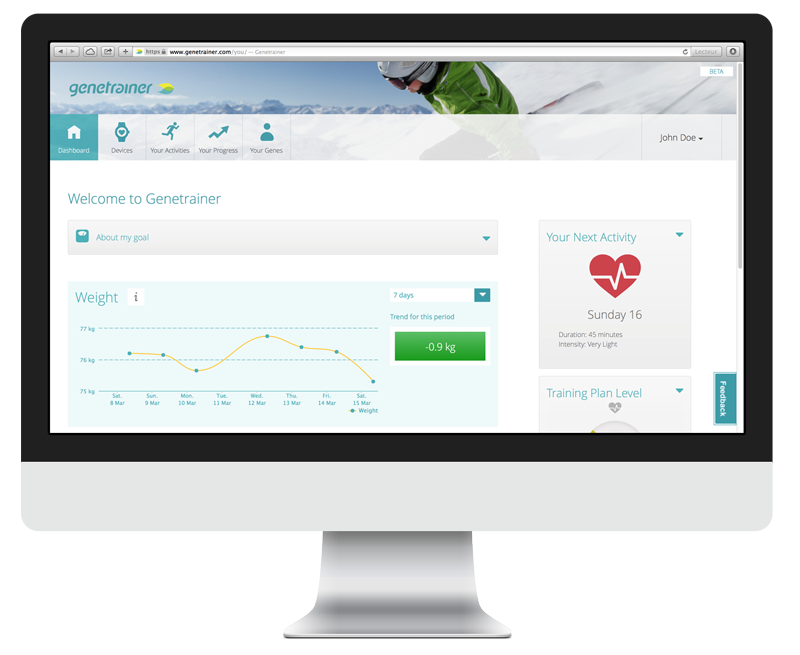 Genetrainer membership gives you access to your results from a range of different traits associated with sport and fitness, such as injury risk, diet, sleep and much more. We’re working on adding new traits all the time, to help you better understand the effect your genes are having on your fitness lifestyle. What took you guys so long? I’ve been on the waiting list for ages. It has been a long journey, and we admit it. Building something right takes time. For several months now we’ve been talking about launching, yet not found the right time. This is because we are continuously adding to the genetic information used in Genetrainer, and this process continues. We’re a small team, we wanted to start with a robust and secure interface and to be sure about the scientific basis of your recommendations. The good news however is that the wait is over. We are inviting people to join, and are working on improvements to Genetrainer every day. I’ve already done a DNA test, but it is not on your list of supported providers. What can I do? We will support any provider which gives suitable coverage of the genetic variations needed for our analysis. If you don’t see your format on the list please contact us to get it supported. How do I connect my DNA data to Genetrainer? If you have done a test with 23andMe it is super easy. Simply enter your 23andMe details after sign up and your data will be transferred securely to Genetrainer. This only needs to be done once. 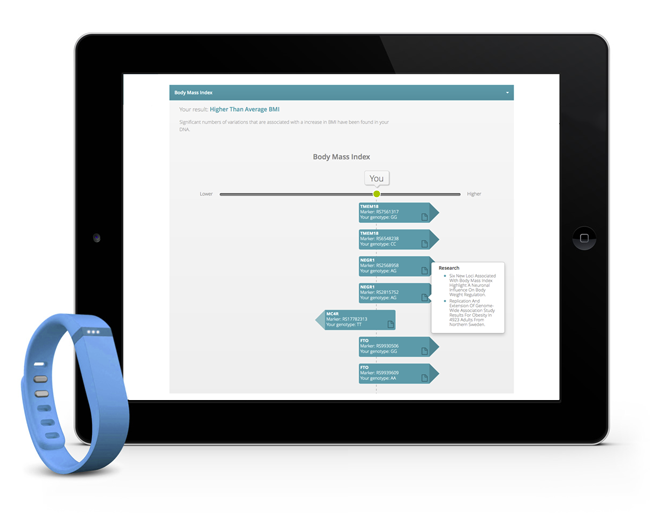 For other formats you can often download your results as a file and connect them to Genetrainer using our upload form. What kind of fitness goal can I choose? Right now you can choose from Weight Loss, Endurance, Muscle Strength, Stress Relief and General Physical Health. We’ll be adding more soon. I don’t have access to a gym, can I still follow the Genetrainer plan? Absolutely. You can follow Genetrainer workouts at home. You will need some basic equipment for some of our circuit training exercises. 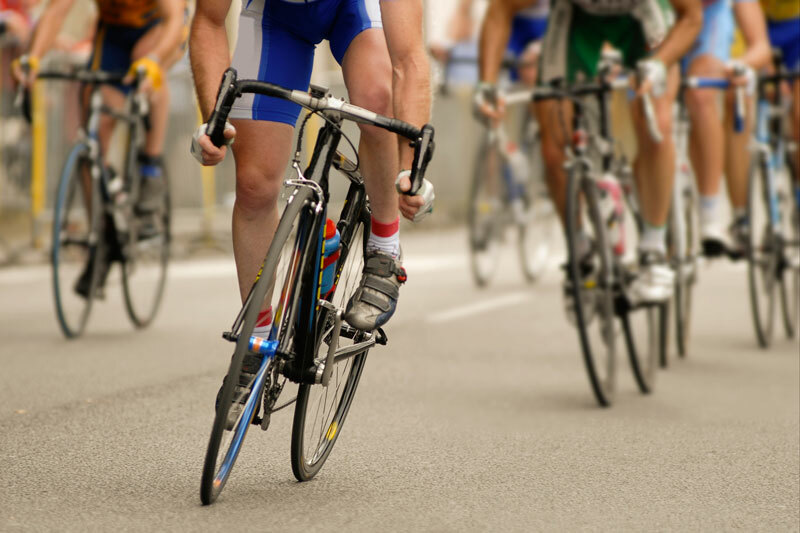 For cardio training we’d recommend a decent pair of running shoes or a bike if possible. You can see the supported devices and Apps on our partners page. How long do Genetrainer workouts take? All Genetrainer workouts can be done in an hour or under, including warm up and cool down. Some are even quicker. Find out how your genes may be affecting your workouts available soon.